Many people have asked me how I write the technical articles for magazines and blogs, book and product reviews, and the non-technical ones for my personal blog. In this article, I will try to explain my writing process. I usually write the posts for my personal blog straight from the heart, the only thing that I do is check for grammatical, style and usage errors. I usually keep it for one day and then read it once again and if I am satisfied, I post it. The book reviews, I write, after reading the book a few times. I note down the interesting ideas and thoughts, the good aspects, the areas where the author could have improved, and so on. The next thing I do is to give a ‘one-to-two’ sentence description of each chapter or section depending on the nature of the book. Finally, I conclude the review with my recommendation—for whom the book will be useful and how useful it will be. Usually I also comment on the readability, the layout, the binding, how the book could have been improved, etc. For writing product reviews, I use the product for at least a few weeks, sometimes more. I usually don’t read the Reviewer’s Guide given by the product vendors as I prefer to form my own opinions and reach my own conclusions. When I review a product (software or hardware) some of the questions that I seek answers are: who will benefit from the product, who are the potential users, how the product will improve the productivity, how the product could be improved, how it compares with the competing products, and so on. Once I post the review, I usually send a mail to the vendor giving him a more technical review about the additional features that could improve the value to the users, the bugs that I have found while testing, better marketing strategies like a market segment that could use the product but not addressed by the vendor and so on. This has helped me in making many friends around the world. Writing technical articles for my web sites follow the same process as writing for magazines but does not involve the processes like editorial review, incorporation of review comments, and so on. As soon as I finish the article (of course after editing, rewriting, proofing, and so on), I upload it to the web site. Writing technical article for magazines is the longest process as it involves many people—sponsoring editor, review panel, writer, copyeditor, layout designers, and so on. Also there are editorial guidelines, which are unique for each magazine. They also vary in detail from a single sentence (the article should not be more than 3500 words) to very comprehensive guidelines as to how it should be structured, what is allowed and what is not, and so on. ERP packages have certain limitations. These limitations will prevent the organization will reap the full benefits of implementing the ERP systems. 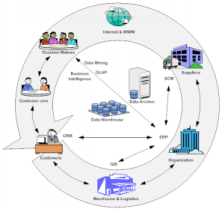 ERP systems streamline and automate only one segment of the supply chain; for the rest of the segments, the ERP system should be integrated with various technologies. This article discusses those technologies and explains how to integrate those technologies to the ERP system. How to survive and stay ahead of competition in today’s highly competitive world. The article will cover topics like how to use technology effectively, how to continuously learn (learning organization), continuously improve (Kaizen), how to be agile and more responsive, how to streamline and automate business process and functions, how to use information as a competitive weapon and so on. Once I decide to write the article, I pull up my old notebooks to see if there are any resources that I could use—it could be a book, a quote, an example, or a case study. When I read a book, magazine or journal, I write down the ideas, thoughts, references, and sentences that I like in my Moleskine notebook. So my notebooks are the first source that I check. If there is something useful, then I will look up those resources and make notes—elaborate notes. Here the idea is to gather as much information as possible so that I will have enough material once I start writing. The next step is searching the Internet for relevant information. My primary search tool is Google, but I also use Clusty, Amazon’s A9, Ask, Alexa, Live Search, and so on. I also search the digital libraries like ACM Digital Library , IEEE Computer Society Digital Library, Web sites of magazines like Harvard Business Review, Scientific American Digital, Nature, etc. While searching these on-line resources, I will take notes—again elaborate ones as before. The only difference is that here I will be copying and pasting the information I want to OneNote. I use a lot of symbols, colors, and images while making the notes. It makes the process more interesting and outcome more satisfactory. Armed with the article outline, I open my mind mapping software—MindManager and create a mind map. MindManager is the leading mind mapping software and my favorite. 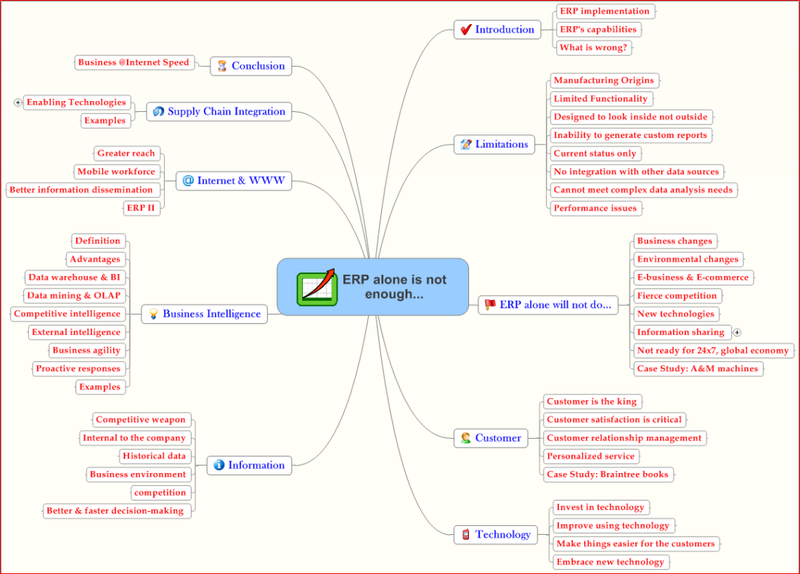 The advantage of using a mind mapping is the ease of organization and reorganization. I just have to simply drag and drop the topic or subtopic from one branch to the other to reorganize it. 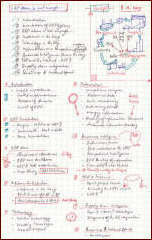 Also, mind mapping helps in generating more ideas than a linear note taking or brain storming session. Once the mind map is completed, I export the outline to MS-Word. 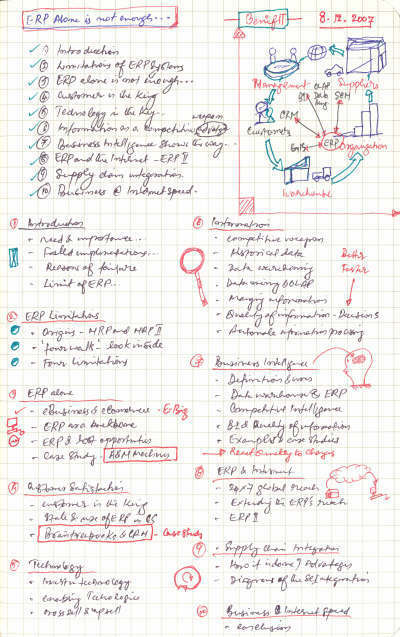 The exported outline (erp_outline.pdf) forms the basis of the article. Now you must be wondering whether I am out of mind to do this kind of iterative process. But believe me; with each iteration, the article becoming clearer, more organized and better. The actual writing takes a few hours. Here all the research and homework I have done helps in completing the article very quickly. When I am writing the first draft, I write from the heart without thinking about grammar, style, organization—write without interrupting the flow. Actually that is a tip that I got from two masters—William Zinsser and Stephen King. Once the first draft is complete, I go through it a few times with a critical mind. Here the main objective is to find grammatical and usage errors, logical errors, and organize the sentences and paragraphs better. While I am revising the article, I usually get new ideas—a better example, a more meaningful case study, a more precise and concise explanation, etc. I will incorporate those into the article—sometimes replacing the existing ones with the new ones and sometimes adding the new things to the document. Once the article is complete, I edit it to remove the flab and make it concise. Another reason for editing is to bring the word count to the specified number. After completing the article, I usually leave it alone for a day and then start editing it once again. I find it much easier and more efficient as I can edit with a fresh mind. I am able to edit it better and in most cases improve the quality also. Once the editing is done I use two tools—StyleWriter and Readability Studio. StyleWriter searches the document for writing faults, including complex words, jargon and abstract words, wordy phrases, hidden verbs, passive verbs, clichés and long sentences. It is an excellent tool in finding the mistakes that escaped the editing and rewriting processes. It also offers suggestions that will improve the readability, make the sentences crispier and clearer. Readability Studio analyzes the document and calculates the popular readability scores. Some of the scores calculated are New Dale-Chall, Spache, Laesbarhedsindex (LIX), Rate Index (RIX), SMOG, Flesch Reading Ease, Flesch-Kincaid, Gunning Fog, etc. It also generates the reports of difficult words used in the document, words that are repeated many times, and a host of other results that will help in improving the document and making it more suitable for the intended audience. 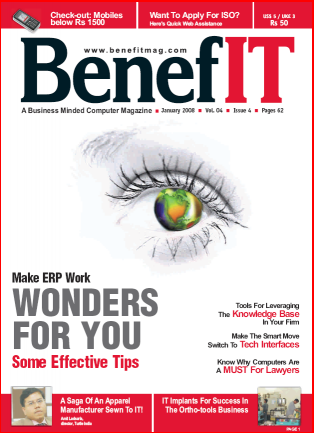 Once the images are incorporated, the final document is ready and I send it (ERP_BenefIT.pdf) to the editor. The review panel will go through the article and see if it confirms to the magazines standards and editorial guidelines. Once approved, the article is given to the copyeditor. A good copyeditor is every author’s best friend. According to Stephen King, “The editor is always right. To write is human, to edit is divine.” The copyeditor goes through the document and makes it more readable, appealing and interesting. Once the copyediting is completed the edited version is sent back to me for my approval and for checking whether there are any technical errors. Sometimes the copyeditor will mark some queries, ask to rewrite a sentence or paragraph for better readability. Once I incorporate the changes suggested by the copyeditor and approve the copyeditor’s changes, the article is given to the layout designer who will insert the graphic elements, artwork, and blurbs and produce the final output that will appear in print. Given below is the article as it appeared in the January 2008 issue of BenefIT magazine. 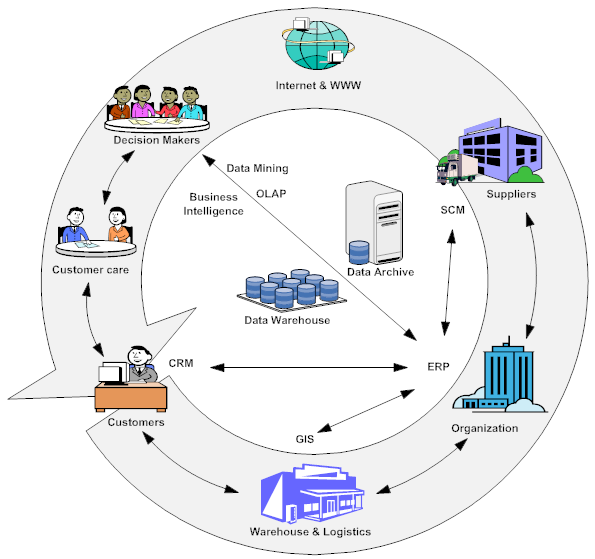 It is titled ERP Works Wonders With Multi-Application Support. Compare it with the document that I sent (ERP-BenefIT.pdf) and you will understand the value addition done during the copyediting, layout design and final production stages. Another good collaborative web-based mind mapping tool for writing is Comapping.com. The left to write mind mapping structure makes it a good tool for writing. Yes, it is a good MM tool; but the need for a always on Internet connection takes away the charm. Also there are other web based tools, which are free like http://www.mind42.com/.